The site has been operating as an open public space for use by local artists and community members since 1986. On April 13, 2016, the City Planning Commission adopted a resolution to approve the amending of the City Map to include the Socrates Sculpture Park, located at 32-01 Vernon Boulevard in the Long Island City neighborhood of Queens. The site has been functioning effectively as a public park for local artists and community members for thirty years, and its memorialization on the City Map as official parkland would protect its existence in perpetuity. In 1985, the Socrates Sculpture Park was conceived as the thought-child of a local artist. At that time, the site on which the Park exists was abandoned City-owned property, which was actively being used as an illegal dumping ground. The artist recognized the site’s potential as an outdoor work- and exhibit-space for artists, which would also provide the local community with open outdoor space by the waterfront. The artist worked with the local community to clear the waste from the site and create the Socrates Sculpture Park. Today, the site is occupied by artwork and sculptures from many up-and-coming artists, while providing the community with open public space on the western Queens waterfront. The abandoned City property was initially under the control of the New York City Department of Citywide Administrative Services. In 1986, DCAS granted the local artist a five-year lease to use for the Park’s purposes. The site then operated under the management of the Department of Parks and Recreation from 1993 until 1998, when the City-owned land was officially re-assigned to DPR. Today, the Park is managed and operated by Socrates Sculpture Park, Inc., which entered into a license agreement with DPR to provide these services. 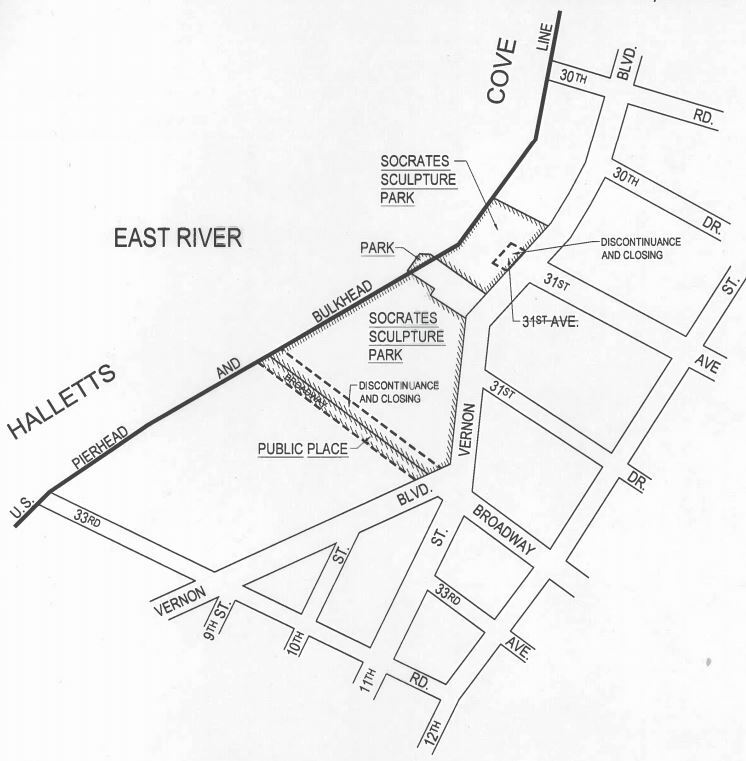 In addition to amending the City Map, the application seeks to authorize the City to acquire a portion of private property, which has served as part of the Park’s entrance-way since 1996 pursuant to an agreement entered into between Socrates Sculpture Park, Inc. and the property owner. In exchange, the City would offer to the current property owner the development rights which the City would otherwise retain as part of the public space. Queens Community Board 1 unanimously approved the application on January 14, 2016. Queens Borough President Melinda Katz recommended approval of the application on February 26, 2016. CPC: Socrates Sculpture Park (050319-MMQ) (Apr. 13, 2016).